Tomatoes and peppers are two of summer’s most-loved foods. However, winter is quickly drawing near, and the garden is dying out, so at this point, you might assume that you’ll have to stop eating these fresh treats or resort to buying them from a local store, but relax, I have a better solution for you. You don’t have to give up your own fresh vegetables for the winter, all you need to do is set up a small area in your garage, shop or barn and you’ll be able to keep on enjoying these summertime favorites throughout the winter. The cost is small, the work is light, and the freshness of the foods is well worth the effort. A little ingenuity and a few easy-to-obtain supplies are all that you need in order to grow fresh tomatoes and peppers throughout the year. Everyone knows you can grow flowers year-round—it’s not any less feasible to grow quality produce in the winter months as well. The first decision that you need to make when choosing to grow tomatoes and peppers in the winter is how large of an area can you set aside for this purpose. It’s not a requirement for the building to be heated, so your barn, shop, or garage will work for your winter gardening project. Pick a spot that is easy for you to get to, while making sure that there is electricity available. Then start planning what kind of tomatoes and peppers you want to grow inside when the frost, ice, and snow are outside. The smaller plant varieties of tomatoes are the easiest to grow this way, types like Tiny Tim, Pixie, Small Fry, and Patio work excellent for this particular project. Peppers that work the best are also your smaller varieties, such as cherry and banana peppers. However, with a little more care, the bell pepper also grows well. It is wise to keep some simple growing aids on hand such as Miracle Grow in case the plants need a shot or two to keep them strong. Miracle Grow is optional depending on if you chose an organic-only approach, if you want your tomatoes and peppers to be organic then the general basics required to grow them in the winter are just the standard plant care requirements: light, space, warmth, and attention. At our place, we have chosen to grow our winter tomatoes and peppers in the garage. We also have a barn as another option, but there the plants would not only be a little more exposed to the weather, but also to the chickens and other foul that live on our farm. Our past experience has proven that there is nothing that will decimate tomatoes faster than a chicken with an appetite. They can, and will, kill anything by scratching, pecking and eating at it, until there is nothing left at all for the humans to have! As we were unwilling to take this chance with our tomatoes and peppers this year, we chose the garage as our winter gardening area. To get started with your winter project you will need to decide if you want your plants to be grown in pots, a trench row, or in some cases, you might even have an earthen floor to in which to grow. If you choose trench rows you will need boards or some other type of material to build a retaining wall to contain the soil and therefore should consider this when figuring the costs. In our case, we chose pots, or in all actuality buckets—a feasible option for many of you who don’t have spare buckets lying around and don’t want to go to the trouble of buying pots! A lot will also depend on whether you grow the plants from seed or start with live plants. We dug up our summer tomato and pepper plants and transplanted them into our extra feed buckets. Next, we moved them into the garage where electricity is easily available. Please note that if you transplant plants from your summer garden into containers it is best to loosen the outside soil from around the roots of the plants before potting them. If you do not do this, the dirt might become too compacted within the pot and cause the plants to weaken or die. If you are transplanting them, keep in mind that the plants may wither a little and possibly lose a few leaves. This is normal because they will be a little shocked from the transplant experience. They should recover without any problems, however. Ideally, you should provide a framework made from wood or metal construction and set up as a cold frame to hold plastic sheeting around the plants to maintain heat. In our case, I am not sure if that was too much work for us at the time or if it was just our plain laziness showing itself, but we used the summer lawn tools as our framework. We set the plants close to the workbench and placed the weed power mower nearby and used that for the framework. It works relatively well and also provides a good brace to which we attached our lamp. Material requirements will vary depending on if you wish to build a framework for the plastic sheeting—if so, 2×4 lumber would definitely be more economical to purchase than, say, metal pipe would be. However, another good idea for cold frames would be to check with stores in your area that might be disregarding used display racks and shelves for winter. Often they will give these away if you just agree to haul them off. These make excellent cold frames for attaching the plastic sheeting and provide good-sized space for the plants under the covered area. The other must-haves for this project are all low-cost and easy to find at your nearest hardware supply store. Plastic sheeting, depending on the size and mil, ranges in cost between $5-$50. 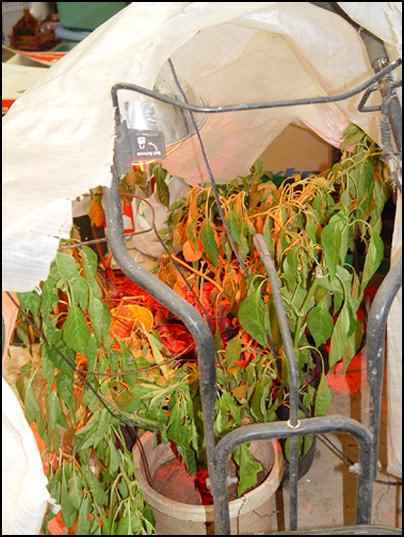 Lighting, a requirement for providing heat to the plants as well as aiding their growth can be provided in the form of a grow light—again, a relatively inexpensive option, as a small one is approximately $15.00. If you prefer to use an old-fashioned heat lamp with an infrared bulb in place of the grow light you will spend about $10-$12 depending on the brand and store where you buy it. Once you have all of your materials collected, you are ready to begin setting up for your winter crop. How you set up your winter project will depend a lot, again, on whether you are starting from seeds or are using older plants. If you do not already have the plants then chances are that you will have trouble finding them at this time of year and you may not have any choice but to start from seed. If you choose to, or must, start your plants from seeds, then you will need to add a seed tray and mix to your shopping list. This ranges from $5-$15 and is key to a good start for the plants. Start the seeds in these kits in the house and once they are growing well, transplant them to your chosen growing area for the winter. If you want to practice a more frugal way of supplying seed kits then try using old salad take-out containers. These are the clear plastic trays that you often get salads or sandwiches to go in from your favorite restaurants and stores. Add potting soil and a little Miracle Grow—if you are unconcerned about being organic—and you have made your very own seed starter kit. Once the seedlings have reached about 3 inches in height, they are ready to be moved and potted into their individual pots. You will need to prepare the soil and have your growing spot picked out for the cold frame. It is important to note that pepper plants are much harder to germinate, and therefore more difficult to grow, from seeds than are the tomato plants. Most often gardeners find it simpler to start their peppers from young seedlings or transplants. Soil preparation for your winter crop is simple: dirt with just a little fertilizer added to help your tomatoes and peppers grow strong and healthy. If you have chickens or rabbits then you already have access to free, natural fertilizer. If you use poultry manure for fertilizer, you need to be certain that it is thoroughly dry before adding it to the soil, as chicken manure is extremely hot and must cure before being used on plants. If it is not cured beforehand, it will burn the plants up before they ever get the chance to grow. Rabbit manure, on the other hand, can be used at any time without detriment to plants or soil. Rabbit manure is one of the best natural fertilizers for plants, and the great benefit of it is that it is totally organic. As the plants grow, continue to maintain the soil in the pots with your chosen fertilizer and be sure to keep the soil moist—especially for the tomatoes. Peppers, on the other hand, need a bit drier soil. Pick a spot that has natural lighting as well as a spot for placing your artificial lighting. 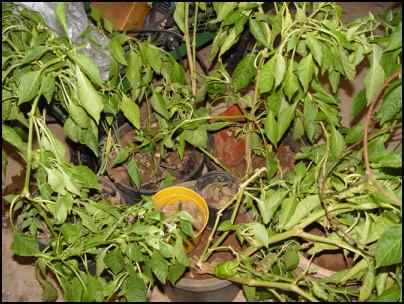 You will need to mist your plants occasionally with water and keep them away from drafts. This ensures that your winter crops have the best chance for winter production. Tomatoes and pepper plants will need either natural light through a window or the aforementioned lamps to make sure that the plants do not become weak or leggy. Tomatoes require at least 12 hours of light a day to produce and do well. 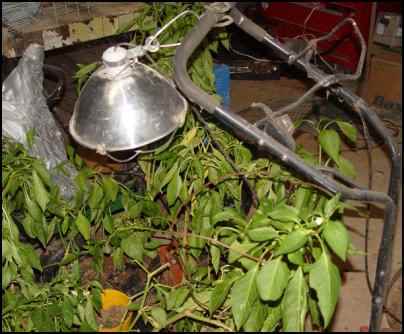 Make sure to turn your potted plants often where all sides of the plant will be exposed to the light at least some of the time. If you are working with tomato plants that are new and have not yet produced, you might need to help with their pollination during the winter months. Outside in the summer the bees and bugs help with this, but in winter the job is left to the grower. When you see blossoms start appear on the plants, you need to move the flowers over other branches and mildly shake the plant. It is also a feasible alternative to blow a small fan over the blossoms to help with pollination. Either way, these actions will help to make sure that pollination occurs. You won’t really need to worry about this on peppers, since they are self-pollinating and will take care of themselves. You may wish to build more than one cold frame and separate your tomatoes and peppers, because pepper plants generally require a warmer temperature than do tomatoes. Separating them would allow you to maintain a higher temperature in the pepper frame than in the tomatoes’ frame. However, they can both be managed well enough together if you are confined on space and supplies. Two different cold frames will double your cost and space allowance, but might allow for better management of your winter crop. Ultimately, you will have to decide which way is best for you and plan your crop from that perspective. Now you have all the information that you need to plan your budget, choose supplies, and select the types of plants that will best fit your situation. You will be able to experience the taste of produce you would otherwise be unable to have during the winter. It is a great feeling to know that while there may be frost outside on the ground, there is homegrown freshness waiting at your table. A little care and planning can go a long way in providing summer freshness in the winter.